A wing-mounted generator emits particles of silver iodide as circular fields of crops are seen in the distance as Scott Bryant flies a cloud seeding mission for the Western Kansas Weather Modification program Aug. 28, 2007, near Lakin, Kansas. A wing-mounted generator emits particles of silver iodide as circular fields of crops are seen in the distance as Scott Bryant flies a cloud seeding mission for the Western Kansas Weather Modification program in 2007 near Lakin, Kansas. 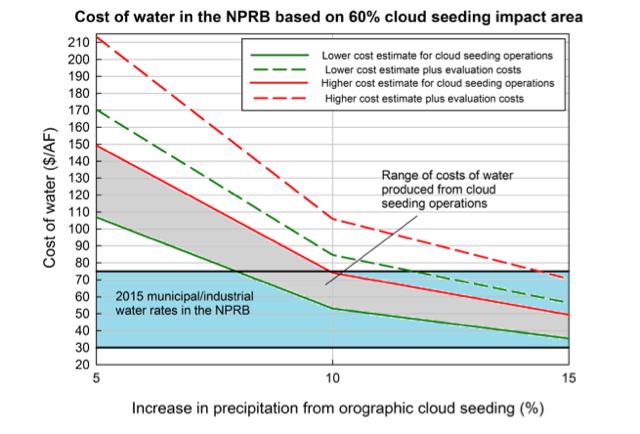 CORRECTION (Nov. 10, 5:45 p.m.): An earlier version of this article misstated the chance that cloud seeding produced a 3 percent increase in precipitation. There was a 28 percent probability that the result was at least that extreme if cloud seeding doesn’t actually work, not a 28 percent chance that the research could have happened by chance.